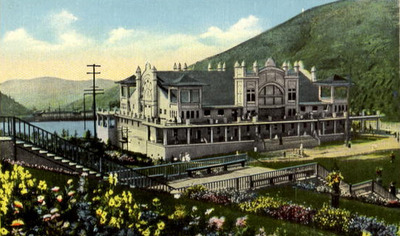 Sometime on their coast to coast travels, the family stopped in at the rootstock of their great wealth: Butte, Montana. 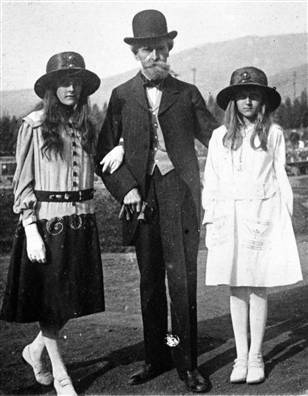 They were photographed there around 1917; Huguette, age 11, and her 15 year old sister Andree. The girls were isolated together in their cocoon of wealth, and Huguette seems never to have recovered from her sister's death from meningitis just two years after the photo was taken. 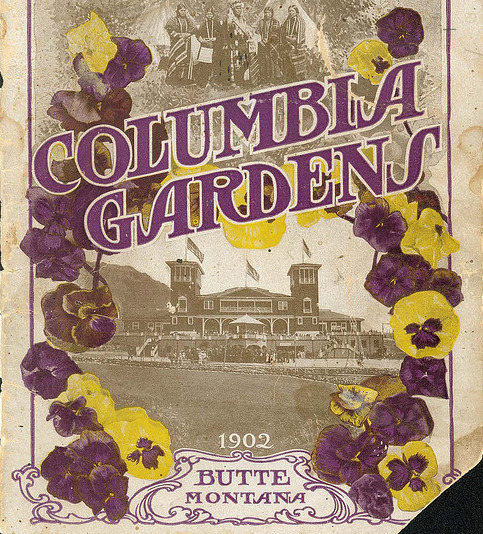 They are standing at an outlook over Columbia Gardens, 68 acres which then-Senator William A. Clark purchased in 1899 and spent $125,000 to improve to serve as a family recreation park for the citizens of Butte. ﻿Clark is supposed to have been ungenerous, a hoarder rather than a sharer of his riches, but he was a local hero for making the Gardens as a retreat for citizens of a city "blasted by the poison fumes from the smelteries in the neighborhood....he [Clark] saw grass fade under the withering touch of the fumes and the branches of the green trees turn to gray, brittle fingers of the decaying body...the arsenic contaminated air of the busy city...to spend frequent afternoons in the groves of the Gardens is to enhance one's desire to live and to forget that Butte is such a terribly dusty, smoky, barren place." from "Sights and Scenes and a Brief History of Columbia Gardens"
He did own the streetcar line that carried visitors to the garden, though (he owned all the streetcars in town) and there were 150,000 visitors the year it opened in 1899, and 375,000 in 1902 when Adolf H. Heilbronner wrote "Sights and Scenes and a Brief History of Columbia Gardens" (available in its entirety at Google books). Those visitors could traverse woodland walks with streamside "alluring spots", rustic seats and bridges; dine al fresco in the picnic grove, stop by the zoo and aviary, or visit the Chinese pagoda and the fish fountain. They could ride a boat down a gigantic 'chute' and into the lake, play on the swings, see-saws and carousel, eat at the cafe, try their hand at the shooting gallery or see a moving picture show. If more enamored of nature than attractions one could embark on a mountain climb into the Rockies, whose dramatic scenery hovered just behind. 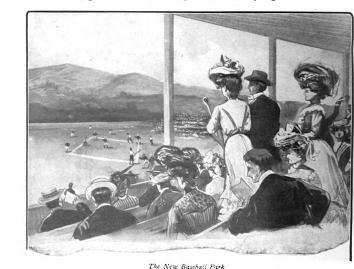 Soon, there was a baseball diamond (center field has never had a better view) and later a roller coaster. And yet even with all this, "...the overshadowing feature, so regarded by the great majority, is the immense floral display. Columbia Gardens, as a pleasure resort, is famed from sea to sea and from Labrador to the Rio Grande River and in foreign countries, as the home of the prettiest collection of flowers in the Northwest...today there are in the Gardens and hothouses more than 150,000 different kinds of growing plants, including most delicate products of the tropics, which are housed in the large glass nurseries. The hothouses are on the list of attractions most enjoyed by the visitors, for here are shown a variety of plants of the most classic order." "In the hothouses are seeded the thousands of pansies that ultimately adorn the flower plots throughout the Gardens. This climate is congenial to the pansy, which, at the Gardens, grows to enormous size, some measuring as large as three inches in diameter. Fifteen thousand pansy plants were transplanted this season, which yielded millions of vari-colored blooms." The children were allowed to pick the pansies on certain days, an event preserved as one of the many postcards of Columbia Gardens that can be found scattered around the web. The pansies were the primary component of the millions of flowers planted out into pictoral beds in a naive, folk-art style. There was a gigantic harp, an anchor, US flags and a butterfly, all superintended by head gardener Victor Siegel, a German immigrant to Butte. 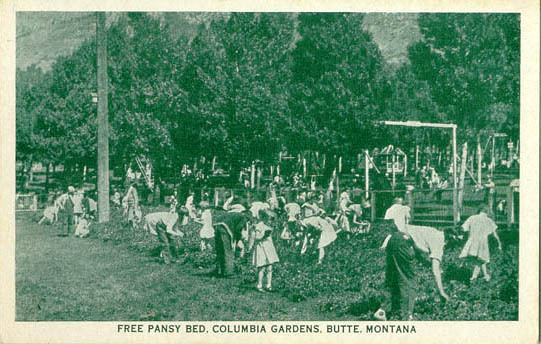 The butterfly was one of most remembered sights of Columbia Gardens, which were permanently closed on Labor Day in 1973 in spite of the strenuous objections of Butte residents. 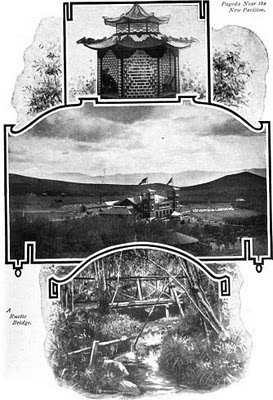 The Anaconda Company, which had purchased the Gardens from Clark famiy heirs in 1928, wanted to expand their mine and took not only the Gardens but the neighborhoods that had over the century grown up around them. 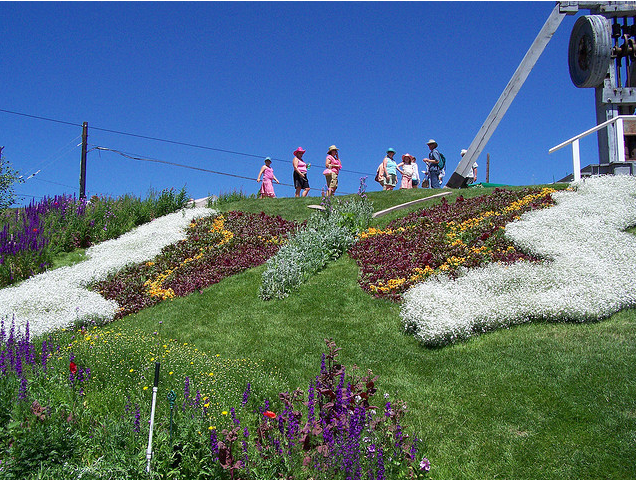 In 2004, the city of Butte restored the butterfly, though they were unable to do so at its original location, which is now a mine pit. ﻿So were Huguette and Andree allowed to partake of the park's delights rather than just pose at its edge? 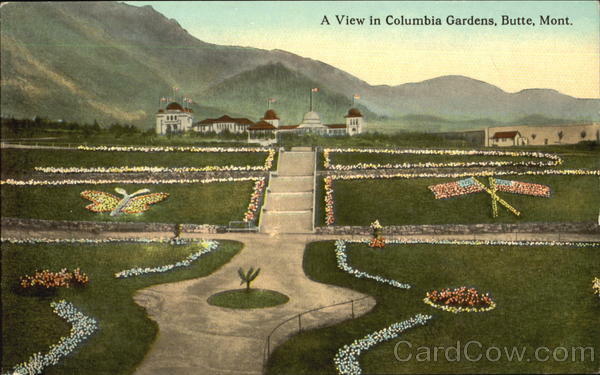 I think so...Clark was justly proud of his what he had made, one of several donations to the city including Montana Technical College and the Paul Clark home for orphaned boys, and said "The Columbia Gardens is my monument. Of my many business enterprises it is the one I love best, and it is practically the only one on which I lose money." 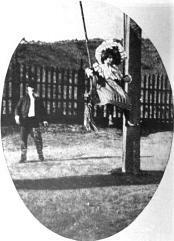 It must have been a scandal, though: Clarks only granddaughter, Katherine Culver Clark, had been photographed on the swings for Heilbronner's book. She looks to be perhaps five in 1902....the same year that Andree was born to a new supposed bride who was younger than Clark's daughters. Huguette did not follow until 1906. It is unlikely that the town residents would have forgotten. Very sad that the gardens went; one wonders why it wasn't made over to the city. I've only started following your blog recently, so I'm not sure how far back in time your interest goes, but when I came across this article about an an ancient royal garden recently discovered in Israel, I thought of you. Do you know much about gardening in the ancient Mediterranean? Do you have any special insider knowledge about this particular garden? Your blog is absolutely fascinating. I always say that a stroll down the garden path can lead anywhere - science, myth, literature - and history. I dabbled a little in history myself this morning - with a primary source. Well, not garden history but flower arranging history.